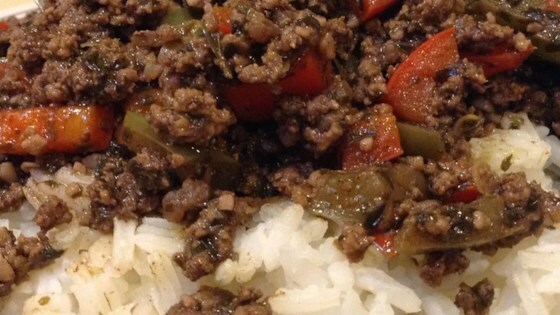 "This ground beef dish is served over jasmine rice and combines the flavors of garlic, soy, and ginger with a hint of heat. A perfect one dish meal!" This was really yummy. Instead of rice, I served it with lettuce cups and a quick sauce made of equal parts soy sauce, rice vinegar, and chile paste. Spicy, flavorful, and crisp! This has become a regular for our family. Substitute more crushed red pepper for the chile paste, and I add a lot more ginger and garlic for a bolder taste.